world of pasta and tomato sauce, Italian food has so much to offer, most of it being excellent. Simple preparations, amazing flavors, pleasing to all the senses. Everyone loves Italian food. True to a common theme within this blog, a lot of Italian food is simple, relying on a few harmonious flavors to work together, without a lot of extra seasonings. Balance is once again key, and knowing how to pair foods together. Synergy is the result. One plus one is three. Explosion of flavor. Where has this food been my whole life? This post is no exception. Affogato is a very simple dessert. In reality, it’s two ingredients combined perfectly. Gelato (or very high quality ice cream) and espresso. Gelato is of course Italian ice cream, and differentiates itself from other ice creams in two ways: It has a very high fat content, usually through the addition of egg yolks and heavy cream. And contains very little air. Ice cream machines have a tendency to incorporate a lot of air into the ice cream through the churning process, but due to higher fat content of the gelato base, less air is found. It makes for a very smooth, rich and creamy product. In this case, coffee, amaretto or vanilla are the most appropriate flavors. It’s exceptionally easy. Put a few scoops on the gelato in a glass and pour hot espresso over the top. That’s it. Simple perfection. Many restaurants add coffee or sweetened liquors, chocolate shavings, chopped nuts or serve sweet biscuits on the side. But the essence of the dish is simplicity. Let the natural and wonderful flavor speak for themselves. Place the gelato in a frosted glass. 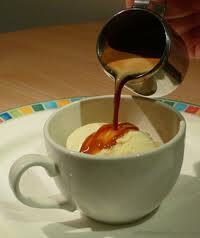 Serve with the espresso on the side, so one may pour the espresso over the gelato just prior to consuming. As a variation, serve sweet Italian biscuits, amaretto liquor, chocolate shavings or chopped hazelnuts on top. Mmmm. I had this on my birthday one year….